So is Megatron really dead - and what about this ancient evil bot, how does he come about? Thankfully, a child's coloring book has all of the answers to Michael Bay's Transformers sequel. Spoilers below. As you can see from some of the pages, Megatron is alive and kicking... I think. (Sorry, even when there isn't any color I still can barely tell where these transforming robots' heads are located.) Reports that Sam somehow goes bonkers seems to be confirmed by his habit of scribbling ancient Cybertronian symbols all over the place. And perhaps the ultimate Transformer weapon is being held inside the pyramids. 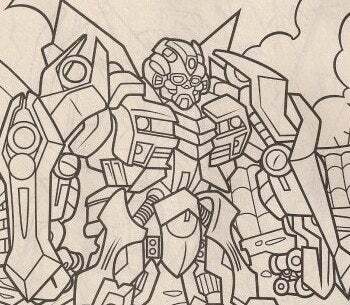 To view more details from the coloring book check out Transformers Live. Transformers: Revenge of the Fallen will be released in theaters on June 24th.